Don't know about you but I'd much rather an Elf help me with my shopping than this dude ... I think he may have accidentally stumbled out of some kind of spandex fetish dungeon over in Vauxhall after sniffing too much Weedkiller. OK, that's unfair. He's probably a lovely guy with a wonderful personality, a kind heart and an impressive amount of masks he can lend you. This description may well in fact be not too far from the truth, for this man goes by the name of The Helpful Gimp. Mobile network Giffgaff is promoting its wares with a series of friendly gimps to help people with their shopping or giving directions. Why gimps, I have no clue and can only assume it's because giff and gimp sound KIND OF similar? Users will be encouraged to create videos using these outfits or objects and to put them online to help make the Giffgaff network more famous. In return they could be in with a chance of winning up to £5,000 or receive free UK mobile calls, texts and mobile internet for up to a year. Giffgaff, an online only business, is the first of its kind. It taps into existing online behaviour where people get involved by creating content, suggesting new ideas, and supporting each other with queries on forums or blogs. The more members get involved the greater the reward and they will receive payback in either cash, mobile credit, or as a donation to a charity or fundraising group. 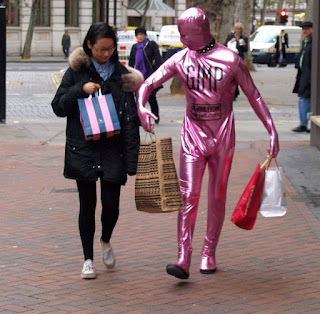 So yes, if you see a man walking towards you in PVC sparkly gimp suit and he offers to carry your groceries home for you don't be alarmed. He means you no harm and really just wants to be your pal.